Parents - your secret is out! We know you’re busy and shopping for diapers and wipes should not take all day! Who has time to shop all over town when your kiddo is leaving snack-riddled fingerprints on the back seat window? Why shuffle through different stores for all your baby essentials when you can make one stop at Sam’s Club? 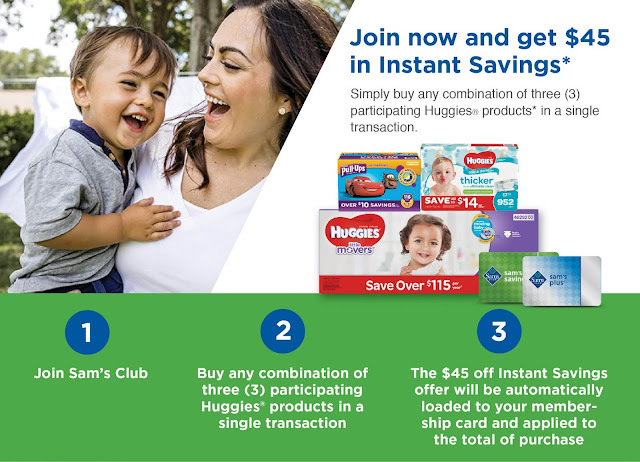 If you’re looking to simplify your life, save money on baby products, and get your Sam’s Club membership all at the same time, check out this great deal on Huggies® products at Sam’s Club! We know how fast-paced parenting can be, so don’t miss the opportunity to put more time back in your day with this quick and easy deal at Sam’s Club! Huggies are such a great brand of Diapers. I love that I can get instant savings with this offer. Now, what should I spend my savings on, lol? This is a great saving for parents out there, plus I know Huggies can be expensive. Any money that can be saved is always great in my books! I always got my diapers at Sam's. It really is cheaper than anywhere else. This is a great deal. I put my kids in Huggies when they were babies - and we still use Huggies wet wipes. A great deal, although investing in cloth nappies would save even more money and help the environment at the same time. Disposables take such a long time to break down. oh, Huggies is a popular brand. My sister's daughter is comfortable when using them. A good product. I've never been a member of Sam's Club, though my dad couldn't live without it. I love that these big box stores are having coupons now. Diapers can get really expensive and it's always great to save money. This is a great deal. Huggies is a famous brand. I will share this information to my friends. I dont use Huggies anymore, my kids are too old but they were my favorite diapers. Will share this great deal with my sister though. Oh this is so smart! I always love it when we can save some money! This is a great deal! I will pass this along to my sister.... she loves Huggies! Great deal will have to send this information to my niece. She has a little one. This would be so helpful for my neighbor! And I wish I had the money to sign up and save. Thanks for sharing. If this is available in our country, omg my Mom would be a member too! We both love to save as much as possible. Its our way of life.